Sunrise over the Sierra Nevada. 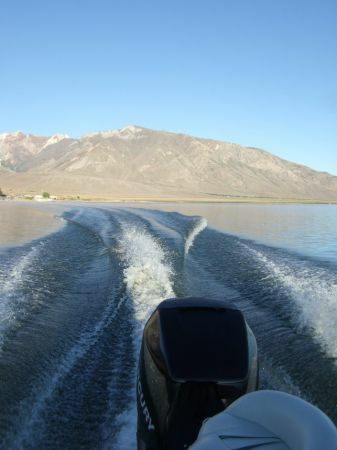 Sunday was a day of travel and the end of our adventure in Eastern Sierra fishing, probably for this summer. (Fall is coming up though!) 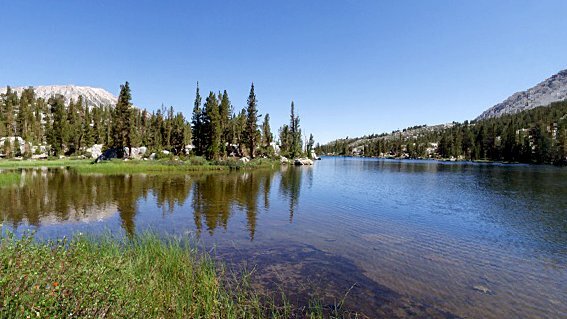 We headed up Hwy 395 for Hwy 120, and made a quick stop on Lee Vining Creek just below Tioga Lake. The water was low and the fish were slow. A few bumps and some following lures, but no bites. Quickly moving along, we were over Sonora Pass and at the cabin by two thirty that afternoon. Soon after we were sitting on the sand at Twain Harte Lake with my sister and her boys. In planning this trip I had given thought to taking a chance on a local put-and-take creek, figuring that any fish that weren’t caught over the weekend might be good targets Monday morning, when I hoped only a few folks would be fishing. Five thirty Monday morning came and I was up. I poked Christopher but he opted for extra sleep rather than extra fishing. I was on the creek about six thirty, with the sun still behind the ridge. This creek is in a canyon of sorts with plenty of streamside trees keeping it cool. Without sunlight the water had an inky cast and I could not see beyond the surface of the water. Guess at likely holding locations for feeding trout, I cast a dropper/midge in position to float it (looking natural I hoped) through the pool. On my fifth cast it was “fish on!” In fact, it surprised me so much that I involuntarily made a good hookset (in other words, I jerked my pole). Soon I had landed a decent thirteen-inch rainbow trout, my fist on my fly pole. For the next few hours it was constant action with a mix of fish to the net and a number of LDRs and missed strikes. When the sun finally began to filter through the trees, I could make out quite a few trout schooling in two different locations. But off in the distance, about ten feet downstream, a single fish was watching a specific feeding lane. Based on the color difference in this trout’s profile, I figured it just might be one of the broodstock brook trout that were put into this creek weeks ago. Maybe one in ten of my casts were good enough to float down the feeding lane, but my dry fly did get some attention. I lost count of the number of casts and of the passing time, but on one particularly good cast he attacked the dry fly, breaking the surface and immediately turning downstream. A quick tug and he was hooked. These brook trout put on a good fight…a lot of head shaking, jumping and runs…so it took about three or four minutes before I had him in the net. It was a big fish. But I had misjudged how played out he might have been. With a mighty flop of his tail he was out of my net and back into the stream. Monday afternoon and Tuesday were filled with typical fun cabin activities. We spent time at the lake, visited Columbia, played bingo, and ate well. I did, however, take time to clean off all of the cabin gear, so we could just store the equipment when we got home. I will remember this trip fondly. I found out that I can indeed catch trout on a fly. 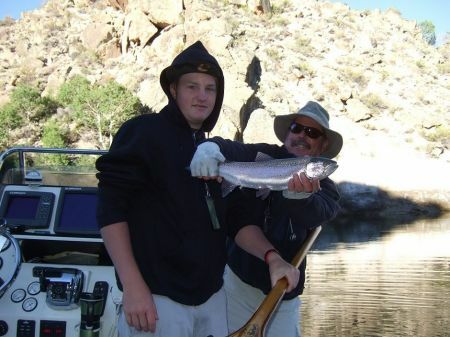 Categories: Christopher, Family, Fly Fishing, Sierra Nevada | Permalink. Our last day at Rock Creek started with our packing for a high along Upper Rock Creek in pursuit of more wild trout. We struck out from the trailhead, which is at 10,255 feet, about nine o’clock. 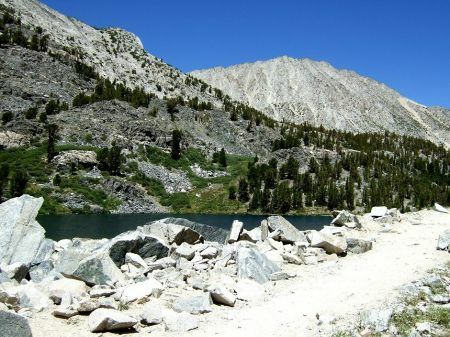 According to what I had learned, the Mosquito Flat Trail offered plenty of opportunities to fish along the creek and the numerous lakes it created while meandering out of the John Muir Wilderness. Unfortunately, the best way to gain access to these fish was to be wading. And we didn’t bring our waders. But we ventured on, leaving quite a few hikers and fisherfolks behind after cresting a steep grade. At Long Lake, about two miles down the trail, we found a few small brookies willing to look at our flies, but no takers. Near the far end of Long Lake, I offered Christopher the option of going on or turning around. After some discussion about golden trout being a possibility in Chickenfoot Lake, the next lake on the trail, and a comment from another fly fisher that it was just ahead, we struck out for Chickenfoot. It was a relatively strenuous climb, but the scenery was incredible…for good reason. I learned later that Chickenfoot is at about 11,000 feet! The fish in Chickenfoot Lake must have been enjoying some underwater scenery as Christopher and I saw only a few rises to our dry flies, and I missed a single strike to my nymph. Funny thing about hiking, though, it’s the return trip that kicked my b**t. We made it back in relatively short order, getting back to the car about one o’clock. After leisurely cleaning up (including showers! ), Christopher and I headed to Bishop for a break, including dinner out and lingered longer than usually in the welcome chill of air conditioning. Being out last day at Rock Creek, I had formulated a plan for that evening based on my previous experiences. About five thirty I waded into the water at “the ponds.” With some cajoling, Christopher had joined me. Starting with a Copper John (a fly designed as a nymph with a reflective bright red body) underneath an Elk Hair Caddis, I cast into a likely pool below riffles. 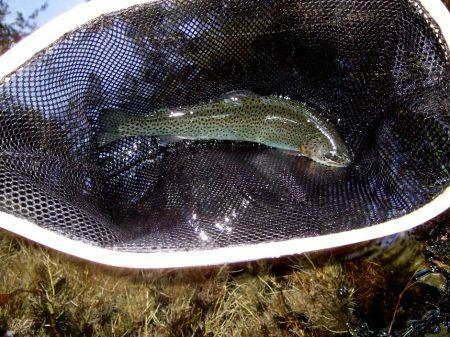 A fish hit on the second cast, and a six-inch brook trout was soon in my net. The rest of the evening was much the same, with Christopher and I picking up wild trout on both nymphs and dry flies. (The fly struck changed as the evening wore on and the food source changed from midges to mosquitoes and other unseen insects.) In the end, I caught and released another ten trout and LDR’d maybe another ten. I blame this mostly on the fact that these smallish trout were trying to strike my too-large Elk Hair Caddis fly. I also missed a few strikes as well. I don’t know how many fish Christopher pulled in, but I did have to convince him to get off the water. So I think he also had fun. Long Lake along the Mosquito Flat trail. Rock Creek along the trail. Friday morning Christopher wanted to pursue larger fish, hoping that Rock Creek Lake would give up some of the recently planted state hatchery and Alpers rainbows. There was little doubt that some fish were there. A few followed spinners in from deeper water just past a shelf, but only one struck my favorite gold Panther Martin, but that ended with an LDR. With frustration, Christopher opted to head down to Rock Creek, which also was supposedly stocked the day before. After enjoying a good steak, we headed back out to “the ponds.” Something was a bit off this evening, as strikes were few and I ended up with only five fish – all small brook trout – to the net. But our guided trip wasn’t the end of my fishing (or catching) for the day. During our day on Crowley Tom told me of some folks who had fished a section of Rock Creek called “the ponds.” It’s an area just below Rock Creek Lake where the creek widens and meanders through a marsh just opposite the Rock Creek Lodge store. 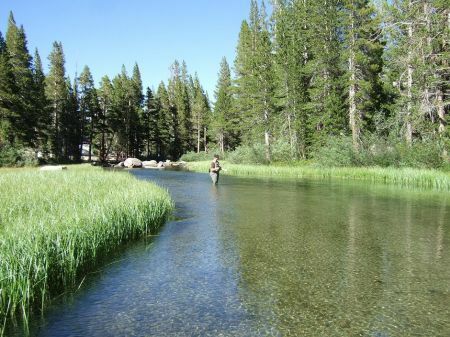 This portion of the creek is populated small wild trout, typical of high elevations steams and lakes. (By the way, this is at an elevation of about 9,500 feet.) Anyhow, these folks had some fun the night before targeting these little trout with midges under a larger fly that is also used as an indicator. Out of my fly box I pulled a small tiger midge and a larger Elk Hair Caddis. Donning our waders, Christopher and I headed into the creek an hour or so before sunset. Christopher had hoped to try spinners, but with few results. I stuck with my fly rod, inspired by my Crowley experience to try nymphing in moving water. 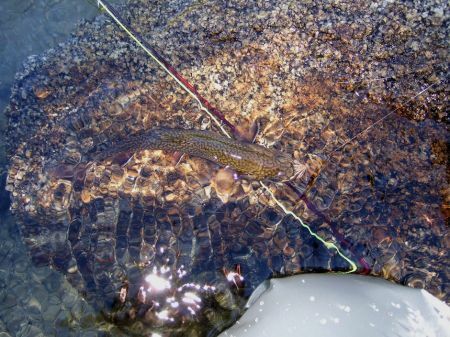 Soon I brought to my net my first trout, a brook trout, caught on my fly rod, albeit with a suggested fly section. It wasn’t a trophy fish, maybe six inches, but it stunned me to think that I was able to cast a fly where it needed to go in such a manner as to fool a wild trout into taking it for a natural food source, in this case a midge. Encouraged, I edged down the creek, targeting areas upstream from the rises made by surfacing trout. I brought a few more brook trout to the net. I lost others to LDR (long-distance release). 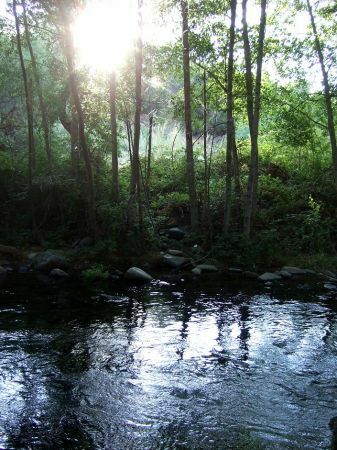 Shortly after twilight began in the canyon, the feeding of these trout changed subtly. They were no longer slurping (a highly technical fly fishing term). They were jumping and breaking the surface of the water, typically at the edges of the marsh grasses. With mounting confidence, I cast closer and closer to the edges of the marshes. This time a fish struck my indicator on the surface. I was so surprised that I didn’t set the hook. Another cast, then another, within six inches of the grass. A strike and set and I soon had a juvenile brown trout in my net. By the time I left “the pond,” I brought a dozen fish “to the net,” lost about eight others to LDR and missed just about as many strikes. It was great! This last trip across the Sonora Pass to the Eastern Sierra will go down in my books as one to remember. And one that brought about new understandings and new respect for my relatively recently adopted hobby, fly fishing. It all began July 18 as Christopher and I leisurely left Benicia in the morning. With my car’s trunk and back seat stuffed with camping and fishing gear, we were off to an adventure that was in the making for nearly a year. 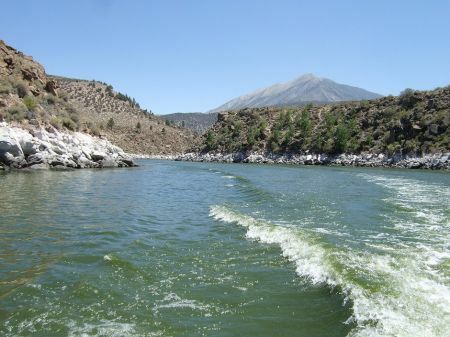 Our destination was the East Fork Campground near Rock Creek Lake, but my imagination was already on Crowley Lake, where the next day was would enjoy our first day guided fly fishing, courtesy Tom Loe of Sierra Drifters. 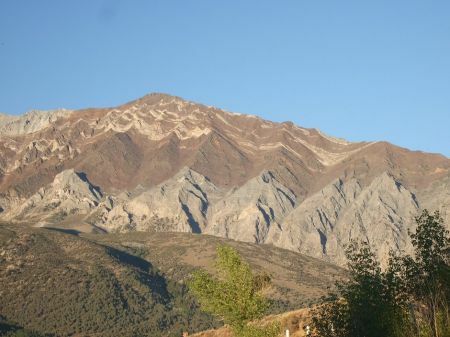 Part of the Sierras, west of the lake. For me, Crowley Lake was a place of mystery since I was wee lad. 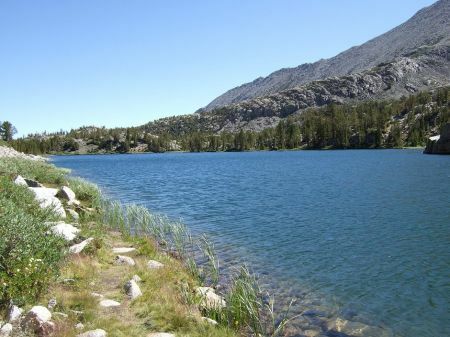 My family would drive by Crowley on the way to Tuolumne Meadows and I would marvel at this man-made, 650-acre body of water (part of Los Angeles’ water system) in the middle of the high desert of Mono County. 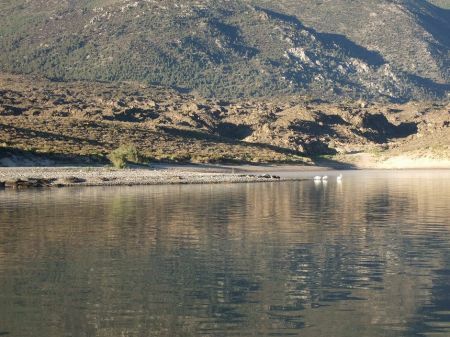 But I wasn’t marveling at the size of the lake or the sheer audacity of its construction, but at the stories we read in the free local tourist papers about the huge trout caught out of Crowley. So when Christopher proposed the idea of a guided fishing trip, Crowley sprung to mind as the place to go. After dropping some items off at the cabin in Twain Harte, we pushed over Sonora Pass; which was nearly devoid of snow. Shortly after four that afternoon, we had established our campsite and settled in. In many ways, Rock Creek resembles a miniature June Lake Loop. Rock Creek Lake sets near the head of the canyon, with Lower Rock Creek tumbling through pine and aspen forests towards Crowley Lake. 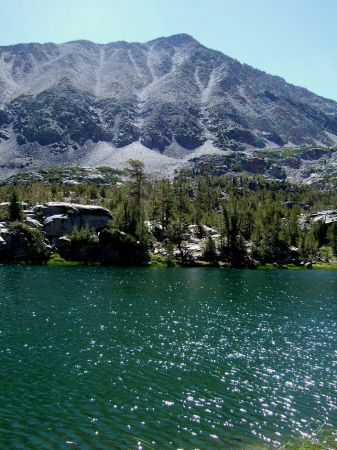 Upper Rock Creek feeds into the lake, descending from its source in the high Sierras. 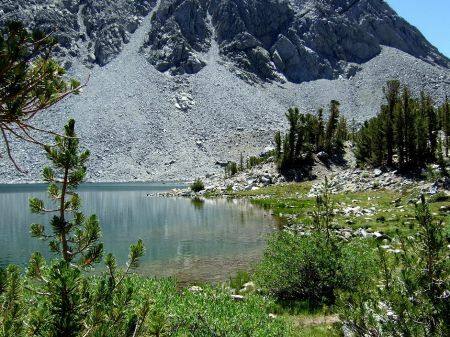 Campgrounds dot the length of Rock Creek canyon and two lodges are found near the lake. A quick call to Tom that evening gave us reason to bed down at an early hour. Fishing on Crowley was good in the morning hours, and our start time was to be sixty-thirty. It isn’t too hard to fall asleep early in the Rock Creek canyon. The ridges that form the canyon rise rather abruptly and just as abruptly bring an early sunset and prolonged twilight. We were in our sleeping bag soon after nine. The sun comes up early in the Eastern Sierra! 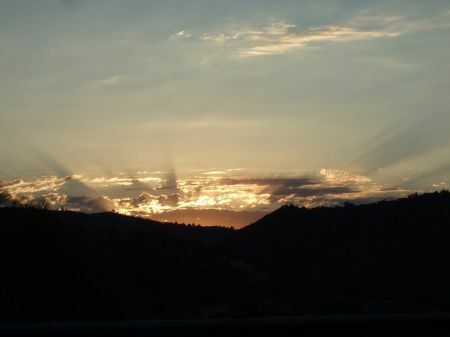 As we emerged from the bottom of Rock Creek Canyon about five forty-five the next morning, the sun was fully ablaze. The air temperature was still a bit chilly when we found Tom waiting on the dock and soon were in his flats-style boat headed to the Crooked Creek inlet on Crowley Lake. 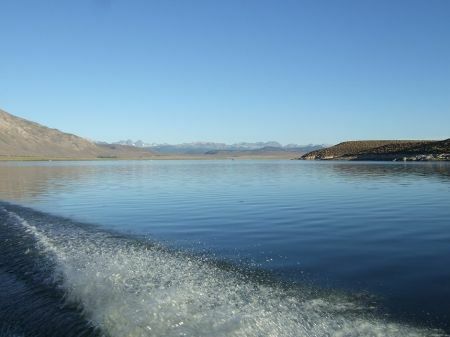 For much of the year Crowley Lake trout – mostly rainbow sprinkled with browns and cutthroats – seek out the cooler and more oxygenated water at the lake’s various inlets. Tom’s plan this morning was to be there waiting when the fish swam up the channel. I had warned Tom that while we knew the theory and had some basic experience, that we were new to fly fishing. He did a great job to taking the time to explain how we should cast and how one goes about stillwater nymphing. (Nyphming is trying to imitate a particular nymph stage of a local insect. In this case, it was midges.) Our rigs consisted of a midge dropped from a Punk Perch (both of Mr. Loe’s design), which were both suspended underneath an indicator composed of a brightly colored yarn. I will confess that our casting left a lot to be desired. With Tom’s advice were we able to place our flies in the suspected path of the trout we hoped to catch. Once our flies were in the water, we were told to keep our eye on the indicator, and if it started to submerge to set the hook. This is a concept counterintuitive to spin fishing, when fish tend to smack into a lure and hook themselves. Consider for a moment the small hooks around which these flies are tied, and one gains respect for setting the hook quickly and properly. 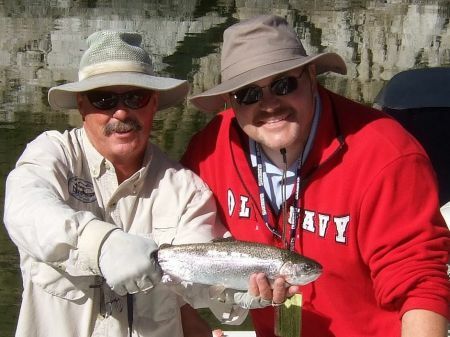 Chris and guide Tom Loe with a nice Crowley rainbow. But Christopher did so, pulling in the first and biggest fish of the day – about 20 inches – within fifteen minutes of Tom setting out the anchors. Tom said he’d put us on the fish and he certainly did. Before ten o’clock Christopher and I together brought 19 rainbows to the net and probably missed a similar number of strikes. I was surprised at the fight in all of the fish we hooked. I don’t think any were shorter than 14 inches and all required a bit of play before we could bring them to the boat. It was an incredible experience. To put together the theory learned in our fly fishing class with on-the-water experience and advice. Best of all, I gained confidence that I perhaps even I could grow into a halfway decent fly fisher. The downside to Crowley is that during certain times of the year a mat of algae blooms, which is then pushed around by the winds. Unfortunately this day the wind was blowing up inlet, pushed an ever dense cloud of algae in our direction. 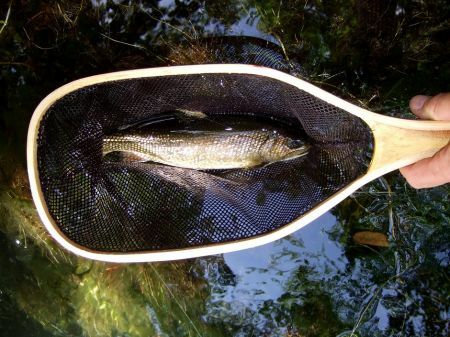 This, in turn, reduces the trout’s’ ability to draw oxygen and pushes them back into the deeper recesses of the lake. As the algae grew denser, the number of strikes fell. It was amazing, however, that an occasional fish could still find our miniscule flies amid the pea soup of algae. As we closed in on noontime, the wind began to tease us, shift direction and pushing the algae out of the channel. Alas, it didn’t push fast enough. For the next two hours strikes were few and my ability to set the hook properly seemed to be diminished…perhaps by over confidence? But as our time on Crowley Lake ended, the idea of a return trip was already firmly planted in my mind. Early morning departure on Crowley Lake. Headed into Crooked Creek arm. The gear is getting lined up, the fishing tackle assembled and the gas tank is full. In less than 36 hours, the Great Fishing Adventure of 2007 will begin. Camping in the Rock Creek area, fishing Crowley Lake, McGee Creek and the Little Lakes Valley. 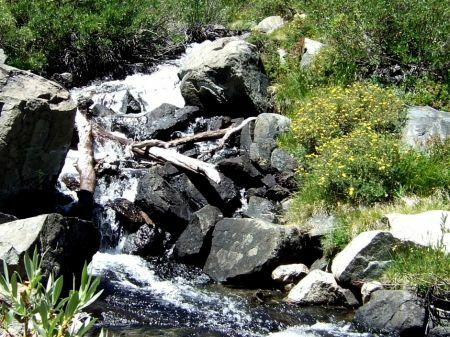 Might squeeze in time at my favorite spot on Lee Vining Creek, then return to the cabin for a few more days of relaxation. It is unknown if I will be able to post any real-time fishing reports from the Eastside, but I will report after the fact, with the obligatory photographic piscatorial proof. 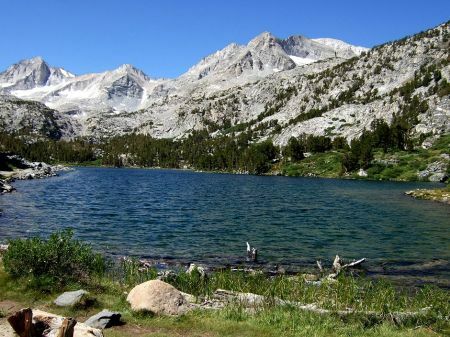 Categories: Camping, Fly Fishing, Sierra Nevada, Vacation & Travel | Permalink. Amazing what one might find in the backyard, so to speak, if one looks long enough. Especially if you follow your nose. Yosemite Valley’s meadows, which have never frozen under glaciers, are home to other endemic plants such as the Yosemite onion, Yosemite woolly sunflower and Bolander’s clover. The Yosemite bog-orchid (Platanthera yosemitensis) is the only known orchid species endemic to the Sierra Nevada range and grows in spring-fed areas at 6,000 to 9,000 feet. Its flowers are less than a quarter of an inch wide. An article in Madroño, a journal of the California Botanical Society announced the species’ discovery. You can google news to find out more, or read more about Platanthera yosemitensis it at Discovery.com or the Fresno Bee.